Sunny. High near 75F. Winds SSW at 10 to 15 mph.. In the past week, I have dined out at four restaurants and at three of these, there was a Greek wine on the menu. More and more, we are seeing Greek wines in the U.S. And, after traveling to Greece the last two summers, I was starting to feel confident in my growing knowledge of the wines. But this week, I learned about yet another wine region in Greece called Pangeon and the winery Biblia Chora. There are 28 wine districts in Greece, and within these districts are the 58 wine areas that have been designated with Protected Geographical Indication (PGI) status. One of these regions is Pangeon in Northern Macedonia, approximately 100 kilometers from the city of Thessaloniki. Established as a PGI in 1995, the vineyards of Pangeon are located on the slopes of Mount Pangeon and on Mount Symvolo at altitudes of 350 to 480 meters. A Mediterranean climate by day and a continental climate by night, the region is known for lots of wind, high altitude and cold nights. The soils of clay, loam and stone are home to many local and international varieties, including assyrtiko, roditis, malagousia, muscat of Alexandria, viognier, gewurztraminer, chardonnay, sémillon, sauvignon blanc, trebbiano, agiorgitiko, lemnio, pamidi, grenache rouge, cabernet franc, cabernet sauvignon, merlot and syrah. One of the largest wineries in Pangeon is Ktima Biblia Chora. Ktima means “estate”; biblia comes from the original biblinos oenos or “sacred wine”; chora means “land.” Biblia Chora was started by enologists Vassilis Tsaktsarlis and Vangelis Gerovassiliou. Gerovassiliou studied in Bordeaux under Emile Peynaud before returning to Greece in 1976 to work as enologist at Porto Carras. He started Ktima Gerovassiliou in 1981. Tsaktsarlis also studied enology in Bordeaux, studying under Denis Dubourdieu and Pascal Ribereau-Gayon. He would return in the summers and work at Ktima Gerovassiliou. In 1992, he began working as enologist for Domaine Costas Lazaridis in Drama and noticed the potential of grapes from Kavala. Together, he and Gerovassiliou planted the vineyards of Ktima Biblia Chora in 1998 and their first vintage was in 2001. While at Lazaridis, Tsaktsarlis worked with Annegret Stamos, a chemist from Germany. Stamos married a Greek man and has been living in Greece for 30 years. She spent 10 years working at Lazaridis and joined Biblia Chora in 2001. As the chief chemist and export manager for the brand, Stamos works closely with Tsaktsarlis. While they have worked together for more than two decades, their connection is even deeper. By complete coincidence, Stamos’ husband’s cousin is married to Tsaktsarlis. 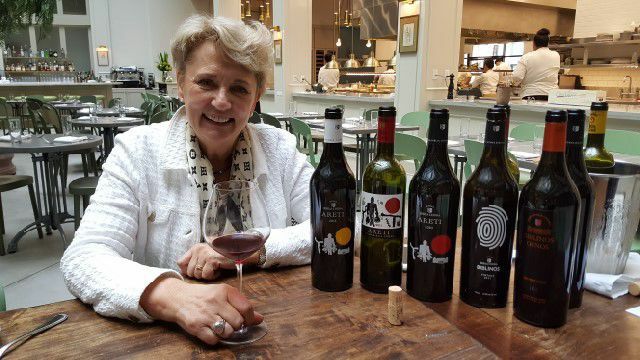 Tsaktsarlis has two children, Areti and Michalis who have both studied chemistry, and has named two of the wines after Areti, even using artwork from when she was child on the label. Assyrtiko is the grape originally from the island of Santorini. There the assyrtiko is all about minerality and searing acidity. The pale yellow Biblia Chora assyrtiko has more citrus notes and softer acidity. The 2015 has aromas of white flowers and the 2014 shows more lemon and grapefruit notes and minerality. Agiorgitiko is originally found in Nemea in the Peloponnese. At Biblia Chora, they were the first successful attempt to make agiorgitiko outside of Nemea. The wine is matured for 10 months in new French oak barrels. A deep ruby wine, agiogitiko is known for its tannin, intense color and fruity aromas of ripe cherry. This wine is made from a local ancient grape variety that was found on the slopes of Mount Pangeon. In 2005, a shepherd found one plant on the mountain and brought it to the winemakers. The large oval berries, which look like olives, grow in big loose bunches. They fermented it and made a rose in 2008. In 2009, they made the first true vintage with the grape. It has gone through DNA testing, however the grape is still unknown. They know that it is vitis vinifera and that it is of Greek origin. But, the voluptuous dark violet wine with aromas of blueberry, pomegranate, rose petals and dried herbs is unique.